Over the past two decades, more Asians in Philadelphia have branched out of Chinatown and into the entire metropolitan area. A local newspaper recently recognized this recent sprawl: “Whether it’s Koreans in Olney, Vietnamese in South Philly or Center City’s Chinatown, Philadelphia has seen a steady increase in its Asian American populations.” Business is booming for Asian Americans in the Philadelphia region. As these communities continue to grow, the opportunity for expanding the market grows as well. • In New Jersey, Asians owns 51,974 businesses compared to 49,864 for Hispanic. • There are 1,250 Chinese owned restaurants in the Greater Philadelphia Area. Restaurants are only 35% of total businesses owned by the Chinese in the region. 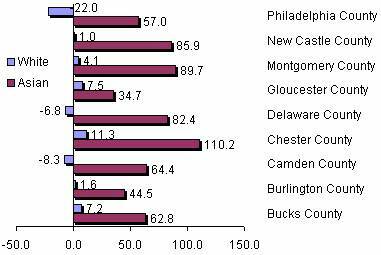 • The Chinese have the highest median income ($95,084) in Chester County. • There are a total of 12 giant Asian supermarkets that cater specifically to the local Asian population. 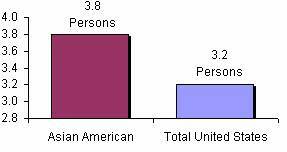 • 18% of UPenn’s 10,000 students are Asian. • 12.5% of Cherry Hill school district’s enrollment is Asian. • There are over ten Chinese Schools in Philadelphia, Montgomery County and Southern New Jersey. Copyright 2007-2010, New Mainstream Press, Inc.